Rebecca (Gaumer) Wymer was born on April 26, 1813 in Washington Township, Muskingum County, the daughter of Daniel and Hannah (Baughman) Gaumer Sr. When she was age 18, on July 14, 1831, Rebecca was joined in matrimony with 23-year-old John Wymer (1808-1887). He was a native of Washington County, PA. The couple produced six known children -- Alfred Wymer, Daniel Wymer, Louise J. Wymer, Hester Ann "Esther" Werts, Rebecca Maria Taylor and Alzina Winn. They made their home in Muskingum County, where in 1849 John joined the Evangelical Lutheran Church. They kept a family Bible, published in 1858, in which they began writing the names of their children and their dates of birth. The Bible inscriptions later were of value for their elderly son Daniel in his efforts to obtain a Civil War pension. John remained a widower for a little more than a year. In the autumn of 1855, he married for a second time, to Margaret Wagoner ( ? - ? ). The Wymers worred during the Civil War as two sons and a son-in-law left home to serve in the Union Army. Then in 1865, John endured the death of his 30-year-old daughter Louisa. She was interred beside her mother in New Hope Lutheran Church Cemetery. John and Margaret lived for 14 years in Muskingum County and then in the fall of 1869 relocated to Lucas County, IA where some of their children had migrated. In late February 1885, to support his son in law Samuel J. Taylor's efforts to obtain a Civil War soldier's pension, he wrote: I have known [Taylor] since he was a small boy. That for three years next predeeding [his] enlistment he lived within a mile and a half of claimant in Muskingum County, Ohio and that prior to his enlistment he was a stout active man." During that period of time, Taylor provided labor on the Wymer farm. Son Alfred Wymer (1832-1919) was born on June 5, 1832 in Salem Township, Muskingum County. As a young man, he stood 5 feet, 19½ inches tall, with a dark complexion, dark hair and brown eyes. He was a veteran of the Civil War and once wrote that "prior to my enlistment, I never had a Doctor in my family." On March 30, 1854, at the age of 21, he was married to 24-year-old Amanda Virginia Filler (1830-1904). Officiating was Rev. Samuel Kaemmerer, pastor of the New Hope Evangelical Lutheran Church, a congregation co-founded by Alfred's grandparents Daniel and Hannah Gaumer. 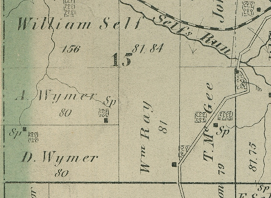 The Wymers made their home in Sun Dale near Norwich, Union Township, Muskingum County. They produced six children -- John H. Wymer, Sarah E. Wymer, Joseph A. Wymer, Willard F. Wymer, Dora D. Wymer and Jennie Manning. A month after the Civil War broke out, in May 1861, Alfred and his boyhood friends James Galliher, J.T. Story and F.W. Sturtz joined the Union Army as members of the 78th Ohio Volunteer Infantry, Company F, commanded by Capt. Avery L. Waller. Galliher later wrote that "we were together all through the war." They first were stationed for training at Camp Gilbert near Zanesville, Muskingum County. ...stuck to him in a greater or less degree all through the war & through the Shiloh and Corinth campaigns, our marches around Purdy, Bethel, Jackson and all the way to Water Valley, Miss., and return to Memphis, Tenn.; when he was compelled to go in hospital for treatment in the latter part o January 1863. Here he remained until about the middle of March -- perhaps -- when he rejioned the company then at Vista Plantation, La. ; still he was suffering with the diarrhea and so weak he could not march, and was left in convalescent camp, at Young's Point, La. ; until Gen'l Grant's army invested Vicksburg, when he again rejoined the company, and still the disease was preying on him, but he chose light duty in the company rather than go to hospital. He went on the Meridian expedition still suffering with the same complaint, and also on the March from Cliffton Tenn., to Huntsville, Alabama. When his term of service ended in mid-December 1863, he re-enlisted on Dec. 18, 1863 as a sergeant in the 78th Ohio. He also suffered from pain in his limbs in late July 1864 while in Atlanta and spent about a month in a field hospital. In August 1864, he was transferred to a hospital in Marietta, GA. Later, he became part of the 15th Ohio Infantry, Company A. He received an honorable discharge at Louisville, KY on July 11, 1865. Upon returning home, Alfred resumed his work as a farmer in Sun Dale. His farm of 80 acres, southeast of Norwich, is marked on the 1876 Atlas of Muskingum County, showing a freshwater spring on the property. The Central Ohio Railroad line passed just to the north of his farm. In March 1879, Alfred wrote and signed an affidavit providing support for his brother in law Samuel J. Taylor's application for a Civil War soldier's pension. He and neighbor Watson A. Johnson began traveling together in the spring of 1880 to sell some of the stock from their nursery, an arrangement which continued for four years until he could no longer stand the rigors of the journeys. I have known Alfred Wymer ever since October 1865. And I heard him complaing [sic] of Rheumatism and Chronic Diarrhea at the time. And in the Spring of 1874, he had a severe attack, commencing April 1st and continued untill Sept. 1874, also in Aug. & Sept. 1887, which continued untill Oct. 1889. And Besides numerous lighter attcks [sic] between times, I have seen him on a average during all this time I suppose about once in two weeks, I have lived from him, all this time about one & one half miles from him, and I consider him totally disabled from manuel labor for the last nine or ten years. When undergoing an examination by military surgeons in 1896, one of the physicians wrote of the pain Alfred was suffering in his hip, shoulder and knee and also noted, "He has 10 fair teeth." Amanda passed away on March 30, 1904. Alfred outlived her by 15 years and died on June 18, 1919. Son John H. Wymer (1856- ? ) was born on Jan. 18, 1856 in Union Township, Muskingum County. Daughter Sarah E. Wymer (1857- ? ) was born on Nov. 9, 1857 in Union Township, Muskingum County. Son Joseph A. Wymer (1859-1935) was born on Sept. 18, 1859 in or near Norwich, Union Township, Muskingum County. He waited until middle age to marry, and in 1900, at the age of 41, boarded in the farm of Jesse and Sarah Richardson in Muskingum Township. When he was 52 years of age, on Nov. 14, 1911, Joseph was united in holy matrimony with 42-year-old widow Sarah E. (Gillespie) Penn (1870- ? ), the daughter of George and Mary (Giffin) Gillespie and a native of Pleasant Hill, OH. Leading the nuptials was Rev. K.A. Shape of New Concord, Muskingum County. Their daughter Helena B. "Lena" Wymer had been born eight years earlier, in 1903. When the federal census was taken in 1920, the couple resided on Marietta Street in Richland, Belmont County, OH, where he worked as a carpenter in a coal mine. 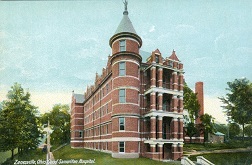 Joseph's final years were spent in East Fultonham, Muskingum County. With his health in decline, Joseph last worked in in March 1935 in farming -- an occupation which had consumed a half century of his life off and on. He was admitted to Good Samaritan Hospital, and just a few days later, on April 4, 1935, suffering from stenosis of his heart valves, he passed away at the age of 75. Burial was in Norwich U.P. Church. Brother Willard F. Wymer was the informant for his death certificate, and noted that he did not know whether Joseph was still married. Step-granddaughter Helena B. "Lena" Wymer (1903- ? ) was born in about 1903. On June 1, 1927, in Belmont County, OH, the 23-year-old Lena was wedded to 27-year-old Thomas Mansel Kirkland (1900- ? ), son of Thomas C. and Margaret (Riley) Kirkland. Son Willard F. Wymer (1869-1945) was born on March 29, 1869 in or near Norwich, Union Township, Muskingum County. He was twice married. The identity and fate of his first wife is not yet known. On Nov. 19, 1902, when he was 33 years old, he was joined in wedlock with his second bride, 34-year-old Helen Evaline Davis (July 17, 1868-1938), a resident of Highland Township, Muskingum County. She was the daughter of John W. and Elizabeth (Hooper) Davis. Rev. J.S. Eaton officiated. Sadly, Helen was burdened with heart disease and senile dementia toward the end of her life. She died at the age of 68 on May 6, 1938. Willard remained on their farm near Norwich. Having endured hardening of the arteries, he suffered a heart attack and was admitted to Good Samaritan Hospital in Zanesville. Three days later, on Nov. 9, 1945, he died there at the age of 76. Amanda Gibson of Norwich signed the official Ohio certificate of death. Interment took place in Bethel Cemetery in Norwich. Daughter Dora D. Wymer (1871- ? ) was born on July 13, 1871 in Union Township, Muskingum County. Daughter Jennie Wymer (1873- ? ) was born on Aug. 19, 1873. At the age of 26, on Jan. 3, 1897, she was united in wedlock with John Wyche Manning (1868-1940). They resided in Milledgeville, GA and produced one known son, Wymer Wyche Manning. Sadly, John died on Dec. 14, 1940, age 72. Jennie was still living as of 1950. Grandson Wymer Wyche Manning married Margaret Ellen Kidd and produced a son, Wymer Wyche Manning Jr. They lived at North Shore Point in Norfolk, VA, where Wymer was a dentist and had offices at 1215 National Bank of Commonwealth Building. During World War I, Wymer served in the U.S. Army from Oct. 19, 1918 to Dec. 17, 1918. He then was a first lieutenant in the Army Dental Reserve from 1923 to 1924 and a captain in the Dental Corps of the 111th Field Artillery, Virginia National Guard, from 1924 to 1940. In 1950, he applied for membership in the Sons of the American Revolution based upon the service of Jacob Gaumer Sr. 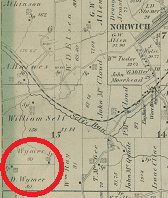 Son Daniel Wymer (1834-1915) was born on New Year's Day 1834 in Adamsville, Salem Township, Muskingum County. As a boy he well knew and played with lifelong friend Solomon D. Sturtz. He stood 6 feet tall, with a dark complexion, dark hair and blue eyes. Son in law Alonzo Allen once said that "he is a man that has no vicious habits, never was a drinking man, never heard of him ever taking a dram." At the age of 21, on April 5, 1855, Daniel married 19-year-old Catharine Elizabeth Brill (1836-1875), daughter of John and Sarah (Wentzel) Brill of Adams Township. Rev. Madison Bray officiated. Their four known children were Sarah C. "Sadie" Guthrie, Mary J. Wymer, Elizabeth "Lizzie" Allen and Charles N. Wymer. He served in the Union Army during the Civil War as a member of the 159th Ohio Infantry, Company B, also considered part of the Ohio National Guard. The company was commanded by Henry S. Allen. Daniel received his honorable discharge at Zanesville on Aug. 24, 1864. He returned home to Union Township where he spent the rest of his long life. Sadly, Catharine became seriously ill and was admitted to the Ohio State Hospital for the Insane at Athens, Athens County, OH. There, suffering from dysentery, she died on Aug. 11, 1875 at the age of 29. Her remains were shipped home for interment in New Hope Evangelical Lutheran Cemetery in Adamsville, Muskingum County. Within 13 months, on Sept. 13, 1876, Daniel married again to Jane "Jennie" Jones (1840-1915), with Rev. L.S. Jones performing the ceremony at the parsonage "near old town church." The couple produced several more children, Willie D. Wymer and John L. Wymer. Federal census records for 1880 show the Wymers living on a farm in Union Township, Muskingum County. In 1890, Daniel was awarded a Civil War pension [Invalid App. #839.703 - Cert. #939.967]. He complained of hemorrhoids ("piles") and sore eyes. His brother Alfred Wymer, age 59, once wrote this: "I have been intimately acquainted with [Daniel] for 50 years or more, and have been living about one fourth mile from his residence for abotu 35 years or more, for the last 8 or 10 years he has been afflicted with Rheumatism so that it has stiffend his body very much, some of his fingers are very much contracted and his back is very stiff. He is also troubled with Dysentery, and kidney troubled, complains very much of stomack trouble, something like Dispensia..." In July 1894, he suffered a sun stroke which rendered him unable to work or even to read. They spent their final years together in Sundale, Muskingum County. His monthly pension payments at the end totaled $21. Further sadness blanketed the Wymers when 29-year-old daughter Mary (June 18, 1857-1886) -- who apparently had never married -- died on Oct. 5, 1886. Burial was in New Hope Lutheran Church Cemetery. Jennie only survived her husband by about seven months. She died on Oct. 25, 1915 at the age of 75. Daughter Sarah C. "Sadie" Wymer (1856-1949) was born on Feb. 8, 1856 in Norwich, Muskingum County. She was wedded to Israel Willet Guthrie (1846-1935), son of Stephen and Barbara (Dennis) Guthrie of Preston County, WV. They relocated to southwestern Pennsylvania in about 1888, settling near Uniontown, the county seat of Fayette County. Their three children were Roy B. Guthrie, Tura M. Guthrie and Iona Irene Guthrie. Israel labored as a coal miner in 1900 as shown by the federal census. That year, their next door neighbors were distant cousins George and Barbara E. (Minerd) Firestone -- a family connection so remote they probably did not even know it. The Guthries' address in 1935 was 59 Evans Street and in 1949 hers' was 69 Dawson Avenue in South Union Township. Israel was treated for prostate cancer during 1935 and succumbed at the age of 89 on Aug. 6, 1935. Circa 1935, daughter Iona Irene Guthrie resided in Yakima, WA with her two siblings in Uniontown. Sadie lived for another 14 years. She died of senility and hardening of the arteries at the age of 93 on May 27, 1949. Burial was in Sylvan Heights Cemetery in Uniontown. Daughter Elizabeth Anna "Lizzie" Wymer (1859-1939) was born on July 24, 1859. She was joined in holy matrimony with Alonzo Allen (1856-1935), son of George Washington and Emily (Black) Allen. They are known to have borne several children, including Grace L. Hadden, Lora R. Allen and others. They were farmers and in 1880 resided in Union Township, Muskingum County. Alonzo often worked for and with his father in law in farm chores. Their home in 1915 was in Norwich near Zanesville, Muskingum County, with Alonzo earning a living as a rural postal mail carrier. Alonzo belonged to the Malta lodge of the Masons in Norwich, and the family were members of St. Paul's Lutheran Church of Sonora, OH. They are believed to have celebrated their 50th wedding anniversary at home in Norwich on Jan. 27, 1929, with a related news story appearing in the Zanesville Times Recorder. Among the guests were Mr. and Mrs. S.M. Hadden and children Samuel and Elizabeth of Belle Valley; Mr. and Mrs. J.A. Bradford, Misses Lora Allen and Ella Ward of Zanesville; Mr. and Mrs. Roy B. Allen and children Jean and Lora Frances of South Zanesville; Raymond Allen and Mr. and Mrs. Rollin A. Allen and children Betty and James of Norwich. The couple received a purse of gold as a gift from their children. Alonzo suffered a stroke and died on July 28, 1935, just six days after his 79th birthday. After Alonzo's death, their son Rollin presented a gavel of wood, allegedly from the estate of George Washington, to the Malta lodge in honor and in memory of his father. Lizzie outlived her husband by about four years. Burdened with heart disease, she was felled by a heart attack at the age of 80 on Aug. 11, 1939. An obituary in the Times Recorder reported that she was survived by seven grandchildren. Circa 1939, daughter Lora Allen was principal of Lincoln School in Zanesville. Sadly, Lora contracted breast cancer in May 1944 and died eight months later on Christmas Day 1944. In April (year unknown), daughter Grace Hadden, living in Belle Valley, OH, wrote to the federal government seeking military service information about her great-great grandfather, Daniel Gaumer. Son Charles N. Wymer (1861- ? ) was born on Nov. 10, 1861. At the age of 18, in 1880, he lived with his father and step-mother in Union Township, Muskingum County. Circa 1915, he made his home at 522 Abington Avenue in Zanesville. He remained in Zanesville for many years and was there in 1939 when he was named in the Zanesville Times Recorder obituary of his sister Lizzie Allen. Son William Daniel "Willie" Wymer (1874-1962) was born on Jan. 12, 1874 near Norwich. He resided in New Concord, OH for 34 years and belonged to the Bethel Methodist Church. He married Louisa Cowden ( ? - ? ) and had a family including Bernadine Jerle, Maxine Bryan, Gaylord Wymer, Leland Wymer and Dr. Ralph M. Wymer. Their home was at 55 Maple Avenue in New Concord, where he was employed as a custodian. In 1962, he underwent surgery for an enlarged prostate at the Butler Memorial Hospital in Butler County, PA, and died of a heart attack after a nine-week's stay, at the age of 88, on July 30, 1962. An obituary was published in the Zanesville Times Recorder which said he was survived by 19 grandchildren and 24 great-grandchildren. Rev. Donald Bible officiated at the funeral, with interment in Bethel Methodist Cemetery in Bloomfield, OH. Circa 1962, daughter Bernadine Jerle lived in New Concord; daughter Maxine Bryan on South River Road in Zanesville; sons Gaylord Wymer and Leland Wymer in New Concord; and son Dr. Ralph Wymer at 1001 East Brady Street, Butler, PA. Son John L. Wymer (1877- ? ) was born on July 31, 1877. He made his home in St. Joseph, Buchanan County, MO in 1915. Daughter Louise J. Wymer (1835-1865) was born in about 1835. She died at age 30 in 1865 and is interred with her mother in New Hope Lutheran Cemetery in Adamsville, Muskingum County. Daughter Hester Ann "Esther" Wymer (1837-1912) was born on Sept. 18, 1837 in Muskingum County. On Aug. 29, 1854, at the age of 17, she was united in marriage with John Jackson Werts (1831-1901), also a Muskingum native. The ceremony took place in Muskingum County. The couple produced 13 children -- among the known names are John Quincy Werts, Mary Eveline Werts May, Lydia Jane Werts Rockey, Alfred Riley Werts William Clement Werts, Flora Ann Werts, Clifton Elmer Werts, Mabel Werts Allen, Charles Martel Werts and Oliver Osmond Werts. Of Esther, the Chariton (IA) Herald-Patriot once said that she "was born in a christian home, her parents being members of the Lutheran church, in which church she also remained until with her husband and children she entered the Presbyterian church in Russell thirty-seven years ago. She taught her children at her knee the religion of Jesus and thus passed on to them her own wonderful faith, so that they have all gone forth into this world christian men and women." John himself had joined the Lutheran church at the age of 13 in May 1850. After spending the first five years of their marriage in Muskingum, they relocated to a farm in Coshocton County, OH. Having spent five years in Coshocton, they migrated to Iowa in 1864 and settled two miles southwest of the town of Russell, Lucas County. In February 1872, said the Chariton (IA) Democrat, "he united with the Presbyterian church in Russell; was elected elder the fourth Sunday in November, 1875, which office he has filled ever since until his death. His was certainly a true, consistent christian life; always willing to take any part of the church duties which were assigned to him.." They remained in the area for decades. In August 1891, they completed building a new house on a town lot in Russell, where they spent the rest of their lives. Sadly, John died on Oct. 27, 1901, and is buried in Russell Cemetery. The Wertses' former pastor and dear friend, Rev. J.Q. Hall, preached at the funeral service. Son John Quincy Werts (1855-1953) was born in 1855 and apparently named after the former President of the United States who had died a few years earlier. Daughter Mary Eveline Werts (1857-1932) married (?) May. Daughter Lydia Jane Werts (1859-1906) married (?) Rockey. Daughter Flora Ann Werts (1866-1871) was born in 1866. She died at the age of five in 1871. Daughter Mabel Werts (1875-1973) married (?) Allen. Daughter Rebecca Maria Wymer (1842-1936) was born on May 11, 1842 in Muskingum County. On June 21, 1866, at the age of 24, she was wedded to Samuel J. Taylor (July 14, 1839-1917), son of John and Susannah (Mock) Taylor who lived just a mile and a half from the Wymer farm. Officiating at the wedding was Rev. J.H. Raggen (or "Rogers"). Samuel worked for his future father in law in the years leading up to the Civil War. He stood 5 feet, 9 inches tall, with a light complexion, sandy hair and blue eyes. They established a home initially on a farm in Adamsville, Muskingum County, and bade goodbye to her married sister Esther Werts when she and her husband migrated to Iowa. Samuel served in the Union Army during the war, with his future brother in law Alfred Wymer, as members of the 78th Ohio Volunteer Infantry, Company F. Samuel enlisted on Dec. 19, 1861, with his company commanded by Capt. A.L. Waller, and served for the duration of the war. He took part in battle at Baker's Creek, near Vicksburg, MS in May 1863, and a cannon ball passed near his head and somehow injured the sight in the right eyeball. While on duty at Vicksburg, MS in August 1863, he and his regiment were ordered to march to Monroeville, LA and were gone but a few days until he contracted "swamp fever," rheumatism, neuraligia and indigestion. Unable to return under his own power, he was placed in a wagon and was transported back to camp in Vicksburg. Fellow soldier P.W. Sturtz urged him to seek medical care. He received treatment from the regimental surgeon. 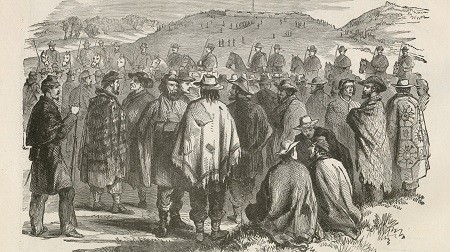 At LaGrange, TN, he received a furlough and returned home to Muskingum County, remaining there with one furlough extension for two months under the medical care of Dr. P.A. Baker. He eventually went back to his unit at the end of November 1863. Soonafter, still ill, he remained behind when his regiment was ordered to Canton, MS to take part in the Meridian Raid. In April 1864, he received a veteran furlough and went back home, receiving additional attention from Dr. Baker. Once the 20-day furlough expired, he returned to the 78th Ohio which now was in Huntsville, AL. Again ordered on a march, but unable to go, he was shipped there via railroad. Samuel received his honorable discharge at Louisville, KY on July 11, 1865. Mrs. Taylor was a grand, good christian woman, possessing many lovable traits of character, and was greatly devoted to her family. In her declining years her Bible was her companion and solace, as most of her family had preceded her in death.... For over thirty years Mrs. Taylor had been affiliated with Jehovah's Witnesses, and as time and strength permitted, she was ever ready and willing to give to each and all "A reason for the hope that was within her." Her request was that upon her funeral occasion the speaker talk of the "Resurrection of the Dead," which hope was set forth in the scriptures and was to her one of Jehovah's greatest promises. It was a beautiful morning when I called upon pensioner. I found him in the yard beating rugs and pillows while his wife was cleaning and airing the house. He moved about actively and freely. I observed him but a few minutes until he saw me, and recognizing me waited until I went up to him. I advised him of the object of my call and served him with the usual notice of special examination and took his initial statement. I had waited up town some considerable tie in hopes of seeing him on the street, as it is his usual custom to go each morning to the post office for his mail at about ten o'clock but that morning he had staid home to assist his wife as stated. His natural movement is quick and he stands and walks erect though not with a vigorous step. His appearance is fair for a man of his age though he is quite thin in flesh. Said the Leader, "He was a firm believer in the truths as taught in the Scriptures, and trusted implicitly in his Saviour." He died in Russell at the age of 78 on Oct. 29, 1917. Adding to the heartache, their daughter Marietta entered eternity the following year. Rebecca survived her husband by nearly two decades and began receiving his monthly pension checks. [Widow App. #1.111.444 - Cert. #863.943] She passed away on New Year's Eve 1936. Her remains were placed into repose in the Russell Cemetery, with Rev. J.L. Shelton of Clariton presiding. Within a few weeks, P.F. Sprague was appointed administrator of her estate. Daughter Jennie Margaret Taylor (1867- ? ) was born on Feb. 26, 1867. She married (?) Threlkeld. She was deceased by 1917. Daughter Marietta J. Taylor (1869-1918) was born on March 12, 1869. She apparently never married. She died at age 49 in 1918. Daughter Cora Evelyn Taylor (1871-1961) was born on July 26, 1871. She was wedded to Grant La Favre ( ? - ? ). In 1936, when she was the informant for her mother's death certificate, she resided in Russell. Daughter Alzina Wymer (1845-1936) was born on Nov. 3, 1845 in Muskingum County. She was married to Robert Jordan Winn (1837-1908). They had one known daughter, Mabel Prause. The family migrated to Arkansas, where they resided in or near Judsonia, White County. Robert died in Judsonia on July 10, 1908. Alzina survived him by 28 years and spent her final time in Arkadelphia, Clark County, AR. She passed away two days after Christmas in 1936. They rest together in Evergreen Cemetery in Judsonia. Daughter Mabel Winn (1879-1973) was born in 1879. She married (?) Prause. She died in 1973.